Kangarilla is a town near Adelaide, South Australia. It lies within the City of Onkaparinga and has postcode 5157. At the 2006 census, Kangarilla had a population of 928. The land around Kangarilla was first settled in around 1840, with wheat and vineyards the main produce. A town was founded in 1849 by John Bottrill, and properly surveyed in 1860. The name was changed regularly in the early days; originally called Scaldwell, then Eyre Flat, the name "Kangarilla" (a word from the local Kaurna language meaning "place of two springs") was settled upon in 1862. The historic settlement of Dashwood Gully (also known as Dashwoods Gully) existed within the present-day bounded locality of Kangarilla. It was named for George Frederick Dashwood, who settled there in 1841 and was appointed as a member of the South Australian parliament in 1843. The first Dashwood's Gully post office opened in November 1863 and closed in 1867; a second post office opened from December 1871 to December 1930. ^ a b Australian Bureau of Statistics (25 October 2007). 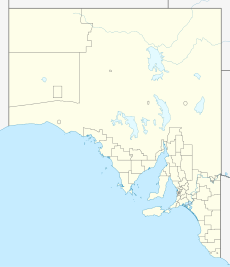 "Kangarilla (State Suburb)". 2006 Census QuickStats. Retrieved 9 August 2011. ^ "Placename Details: Dashwood Gully". Property Location Browser. 25 July 2007. SA0017978. Retrieved 22 December 2017. Feature Type: Gully; Derivation of Name: Captain G F Dashwood, RN; Other Details: Captain Dashwood settled there in 1841. ^ "'A hill's post office near Dashwood's Gully' [PRG 1316/12/150] • Photograph". State Library of South Australia. Retrieved 22 December 2017. ^ "Dashwood's Gully (1)". Post Office Reference. Premier Postal. Retrieved 22 December 2017. ^ "Dashwood's Gully (2)". Post Office Reference. Premier Postal. Retrieved 22 December 2017. This page was last edited on 27 January 2018, at 11:18 (UTC).